Last weekend, my wife and I were blessed by a small but close group of friends at the office. We gathered in order to pray over and anoint our new space. We know that we have been called to do God’s work here on Earth and we give it our best everyday. 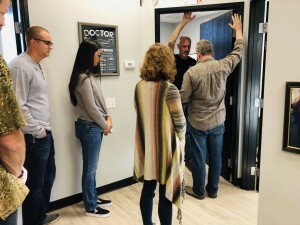 We see our little clinic as more than just a chiropractic office, we see it as a ministry as well. We are truly blessed to be able to serve our community in the capacity that we do. It was amazing to see our community rally when I suffered my injury in January of last year. My family received so much support in so many forms. So many hugs and prayers, meals delivered to our home for our kids and hospital for Veronica and I, gift cards for meals, an RV delivered to the hospital for my wife to stay in and even our home cleaned and repairs made. Our dogs were boarded for free while we were away from home! I was brought to tears to watch the turn out for the Blood Drive that was organized in my honor. Have you ever heard of a Bone Broth Train? We had not until my wife told one of our friends we needed broth. That friend rallied the troops and we had a Bone Broth Train going the very next day! We received very generous financial support as well. Friends, patients, and even strangers donated. Dr.Wilder, God bless her, kept the office doors open and ensured that, upon recovery, I’d have an office to return to. We were able keep the office open, make payroll and pay our mortgage thanks to the gifts from so many. My wife and I know that we are doing the Lord’s work and we know that He is the driving force behind our practice. Now He has called us to give back. This office expansion dedicated to our patients and our beloved community! Starting in January you’ll have the ability to schedule same day appointments and access to 4 doctors over 6 days of the week! Thank you for putting your trust in us over the last 21 years! We are so thankful and humbled to be part of such an incredible community to serve in! We are so blessed to have you! Thank you for all you do for our family and community!